If you increase the number of beads used to stitch the peyote bezel for the Rivolis, you will need to increase the number of 3mm Swarovski bicones used. On a comfortable length of beading thread (no longer than 5'), pick up 28 Delica beads. Pass through the first bead picked up and pull to form a ring. Using tubular even-count peyote stitch, stitch the first round of the bezel, keeping the work flat with your fingers as you go. Make sure that you make the step up at the end of the round. Stitch a total of eight (8) rounds in tubular even-count peyote using the size 11 Delica beads. Keep the work flat until Round 6, and then place the Rivoli into the center of the ring. Pull the thread snugly so that the work cups up and around the Rivoli. Hold the Rivoli in place with your fingers while you stitch Rounds 7 and 8. If you have never stitched a peyote bezel for a Rivoli before, read through this detailed tutorial before you begin. You do not have to include a round of size 15 seed beads if the bezel fits the Rivoli snugly. If the bezel is a little loose, stitch one last round using size 15 seed beads. Pick up a size 15 bead, a 3mm bicone and a size 15 bead. Skip the space between Delica beads and pass your needle into the next Delica bead of the fifth round. Pull snugly so that the beads wedge themselves into place in the space between Delica beads. Continue to add beads in this manner until you have added 14 bicones around the edge of the Rivoli. Note that if you increase or decrease the number of Delica beads used to make the peyote stitched bezel, you will have to increase or decrease the number of bicones used to embellish the bezel. 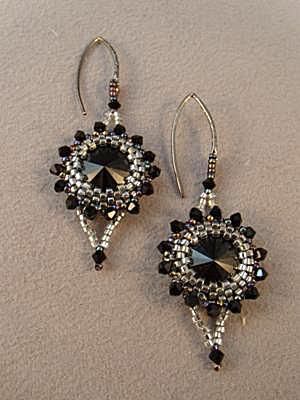 To add the swag at the bottom of the earring, weave your thread back one more bead behind the row with the bicone embellishment. Pick up eight (8) Delica beads, one size 15 bead, one 3mm bicone, and one size 15 bead. Skip the last size 15 bead and pass needle back through the 3mm bicone and the size 15 bead. Pull snugly. Pick up eight (8) Delica beads. Skip the next two beads in the round and pass needle into the next bead in the round. Pull snugly. This is how the bottom swag should look when completed. To get into position for the next step, weave needle and thread through the same row to a bead that is directly in line with the bead you just wove into. This is where you will start the swag on the top of the Rivoli so that it hangs even and straight off the of the ear hook. Pick up eight (8) Delica beads; one size 15 bead; one 3mm bicone; five size 15 beads; the ear hook; and four size 15 beads. Pass needle through the second size 15 bead picked up, the 3mm bicone and the first size 15 bead picked up. Pull snugly. Pick up eight (8) Delica beads. Skip the next two beads in the round of the bezel and pass needle through the next bead. Pull snugly. Weave the ends of the thread into the bezel, pulling snugly. Knot with a half-hitch knot, add a drop of glue or clear nail polish if desired, weave in a bit more thread, and then trim the thread close to the beadwork. You can make the bezel tighter and sturdier by weaving in as much thread as you can. Be careful, however, not to break any beads in the bezel. If you come to a tight spot, quit while you're ahead!